There are many different things you can do to prevent stretch marks. Stretch marks are caused by rapid stretching of the skin. The most common place for stretch marks is the abdomen, but they can appear anywhere on the body such as the breasts, thighs and arms. Stretch marks usually appear blue or purple. In some cases, they will disappear on their own over time. The people who are at the greatest risk for developing stretch marks are women who are pregnant, those who start a muscle-building routine, and children who are going through puberty. Here are some things you can do to reduce your risk of developing stretch marks. To help reduce the risk of developing stretch marks during pregnancy, it is best to apply a moisturizer with Vitamin E, cocoa butter or shea butter in it. These moisturizering oils have antioxidants in them to help promote healthy skin. These products are available in creams, lotions and oils. You can also add Vitamin E oil to your bath water. This will help the oil soak into your skin while you are relaxing. Applying these moisturizers at least once or twice day will help prevent stretch marks from developing. Drinking water helps to keep your skin hydrated. 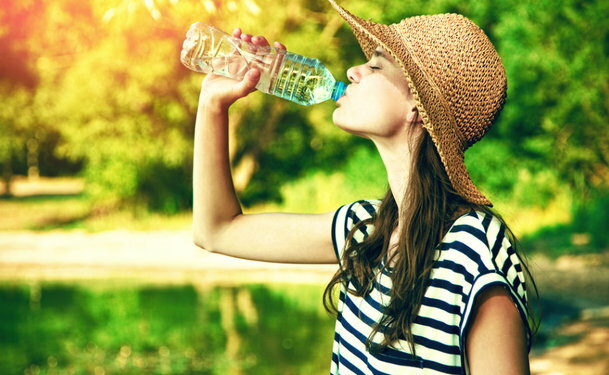 The more hydrated the skin is, the less likely you will develop stretch marks during pregnancy or any other time. The FDA recommends drinking at least 8 glasses of 8 ounces of water per day. If you are needing to gain weight due to pregnancy or if you are underweight, gain it slow. This is good advice for those lifting weights to gain muscle also. If you gain the weight slowly by eating healthy, your skin will stretch, but without leaving the stretch marks. If you are weight lifting, start off slow and work your way up. By doing this, you can avoid developing stretch marks on your arms and legs where you are trying to gain muscle. Exfoliate your skin about once a week to remove any dead skin cells that may be hanging out. This helps to rejuvenate your skin and make it feel softer and smoother. It is best to use a gentle exfoliant which can be purchased at any local drug store. If your are gaining weight or building muscles and want to reduce the chance of developing stretch marks, apply a deep conditioning collagen lotion or skin firming lotion at night before bed. By applying this, you can help your skin to tighten while you're sleeping. After applying the lotion, place a warm towel over the treated area. This allows the lotion to soak into the skin better. There are many ways to prevent developing stretch marks, but keep in mind that in some situations, they are not preventable. The best way to avoid developing stretch marks in the first place is to maintain a healthy weight and keep your skin hydrated. If you are pregnant, body building or going through puberty, try these ways to prevent stretch marks.